The dates are set and entries open for one of New Zealand’s most challenging endurance events with a brand new race hub in Wanaka. Red Bull Defiance returns to Wanaka, New Zealand on the 19th and 20th January 2019 marking the fifth edition of one of the world’s most challenging endurance events. The gutsy two-day adventure race is the creation of Red Bull athlete and New Zealand Ironman champion Braden Currie and attracts leading multisport athletes from around the world. Red Bull Defiance Race Director Bex Law says the weekend event is unique with its two-day format for two-person teams. 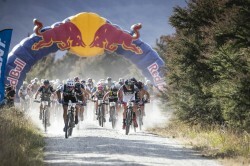 Edgewater Wanaka, located on the foreshore of Lake Wanaka, has been announced as the new Red Bull Defiance race hub for 2019. The high-end resort will host all pre and post race activities including competitor registration, gear check, start and finish lines. Edgewater Events Manager Ellita Thomas says the multisport event is a boost for the resort. “We are so excited to be part of Red Bull Defiance next year. It is such an amazing sporting event, and Edgewater hopes to complement the event nicely," says Ellita. Red Bull Defiance will be hotly contested in January 2019 with entries open from today. Race Director Bex Law says Super Early Bird prices for the month of May are a reward to early entrants.